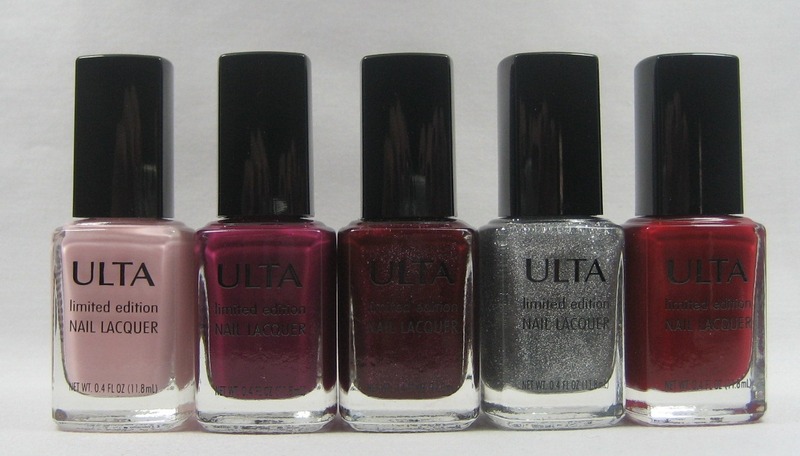 As part of their many promotions and special items for the winter holidays, Ulta put out some limited edition nail polishes in the salon line. I'm not sure how many colors there were in total, as there wasn't a display in the store with names on it, just a bin, and the Ulta website is no help. I found five: Noel (light pink creme), Socialite (red violet creme), Star Party (wine shimmer), Sequins (silver glitter), and Deck the Halls (red creme). Left to right: Noel, Socialite, Star Party, Sequins, Deck the Halls. Star Party seemed the most interesting to me in the bottle. 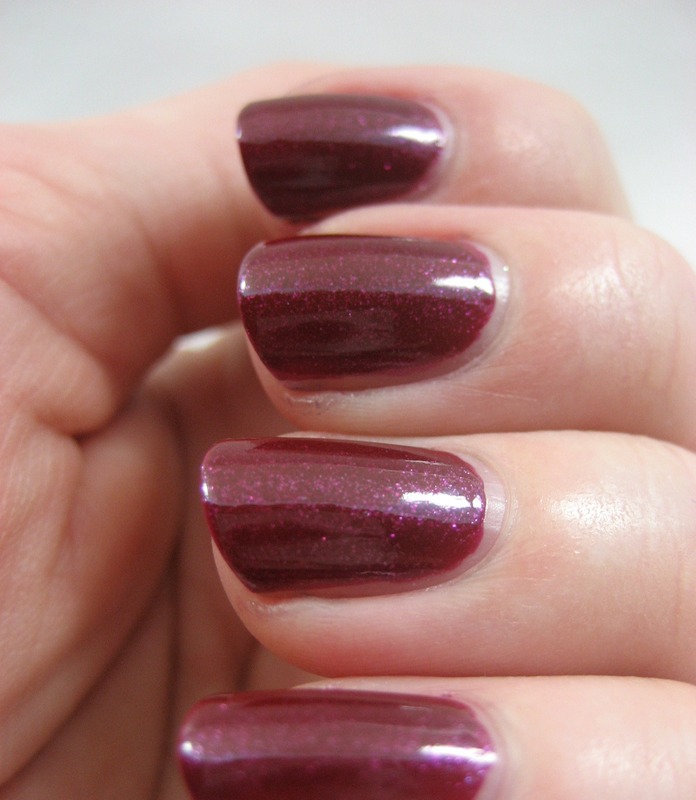 I liked it on the nail as well; the pink shimmer in the wine base is pretty. This swatch is two coats, no top coat. I tried the glitter, Sequins, next. 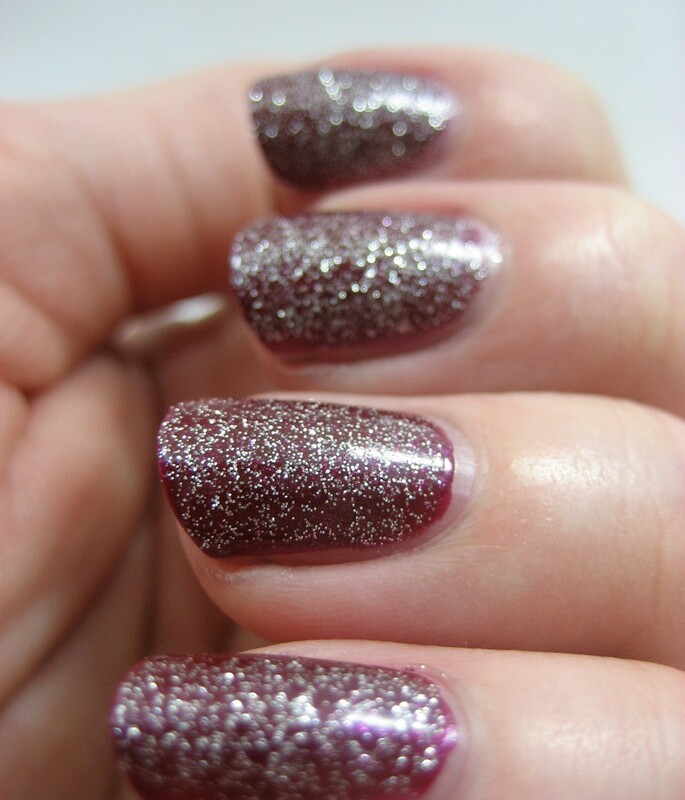 It's small silver glitter in a clear base and was surprisingly dense; the swatch is one coat over the Star Party. I didn't try the three cremes, because there are so many seductive glittery and shimmery polishes waiting in my swatching queue, and I expect the cremes will look the same out of the bottle as in. Maybe not, and I did buy them (there was a sale and I am a completist), so there's always a chance they'll show up in a future entry. Reminder: you have until midnight Eastern U.S. time on December 12th to enter my holiday giveaway. I haven't seen these! :) They looks nice though. I got all 5 too! I really like the fine silver glitter, I don't have one like it. i got the silver glitter also. i thought it would be sheer, but it's still nice. Aha! Star Party's mine now, too. I love it!! I like how dense that glitter is. PRETTTY! I have yet to buy an Ulta lacquer. It just never seems to happen when I'm in a store, go figure? Anyways, you picked the best 2 in the bunch to swatch. I'm not a fan of red but I agree that the pink glitter in the red base is different and looks good. I'm not a big glitter fan either...but if you are gonna own some, they should actually show up on the nail and for a single coat of glitter in a clear base...that has excellent coverage. I have these and I can't wait to compare them to last years. Same shades, same names!